The Advertising Standards Authority has banned five ads by Hubbly Bubbly, the e-cigarettes company, for being irresponsible. The ads featured on social media sites and on the Hubbly Bubbly website. One featured Zayn Malik, the former One Direction boyband star, and singer Cheryl Fernandez-Versini, referring to the celebrity fans of the product. Another on Twitter showed two young women using e-cigarettes. The third ad was a tweet showing two young people using the product and standing in front of a row of bottles of spirits. The text said: "End of a very productive week at HB. Ready to kickoff [sic] the weekend! #TGIF." 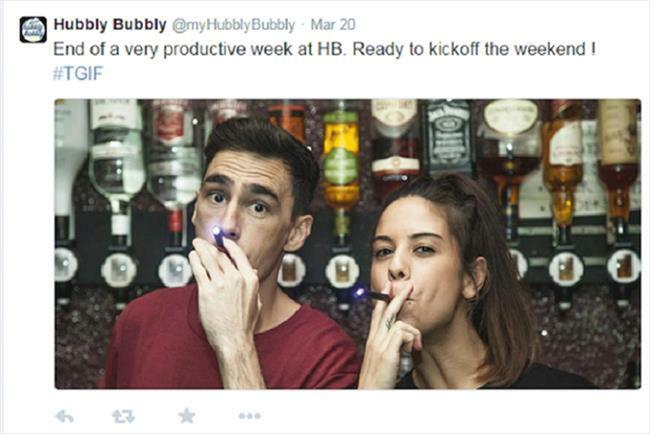 A further tweet showed an image of a woman holding an e-cigarette with the text: "Hubbly Bubbly – getting you through the midweek slump! #ECIG". The final ad under review was a YouTube video with scenes of bars, nightclubs and a music concert, and people were shown using the Hubbly Bubbly e-cigarettes. The Medicines & Healthcare products Regulatory Authority complained that the first two ads did not make clear that the product contained nicotine, were irresponsible because they would appeal to under 18s, and the third seemed to show people who were under 25. The ASA questioned the third and fourth ads on whether the people were under 25. It claimed the fifth ad was irresponsible because it was likely to appeal to under 18s. Following the complaints, Hubbly Bubbly removed the ads. The company said that there was no need to mention the nicotine content of the e-cigarettes because the ad did not promote a particular product. It added that the celebs mentioned in the ads were adults and said that its Twitter profile said people needed to be aged 18 or over to follow the page. The company also said that the models used in the ads were over 18 and those with e-cigarettes were over 25. Hubbly Bubbly agreed that the lighting and make up may have made them look younger, and have removed the second, third and fourth ads. The ASA adjudication said that as Hubbly Bubbly was promoting all of the range, there was a need to include nicotine content. With regards to the celebrity names used, in particular Zayn Malik and Cheryl Fernandez-Versini, the ad would appeal to under 18s, the watchdog said. It also said the models used in the ads were dressed "as a whole reminiscent of young urban fashion" so would be likely to appeal to those aged under 18 years. The ASA added that the female models in the ads using the e-cigarettes did not appear to be aged over 25. As a result, the watchdog called for the Hubbly Bubbly ads not to appear again in the current form.